The 10th community-based adaptation conference culminated in Dhaka last week with a strong message to engage communities in climate change action. This implies a greater role for local governments and communities in determining how climate-related decisions are made. Empowering communities will require building capable local governance systems and ensuring that stable, predictable and flexible finance is directly available to communities most in need of adaptation finance. The Green Climate Fund (GCF) is one of the largest sources of climate funding. It had received pledges from developed countries totalling US$10.3 billion by the end of 2015. The direct channel uses National Implementing Entities (NIEs). These could be local or national governments, civil society or private sector agencies. Under the direct access route, a country can select one or more NIEs to access, manage and distribute GCF funding – without going through multilateral agencies. Giving countries direct access to funds is designed to increase ownership over projects and improve institutional capacities; each entity seeking to direct access funds is also expected to adhere to stringent accreditation requirements. Direct access also places climate finance under the democratic accountability and control systems of the country concerned. The GCF is now in the process of accrediting entities that will be able to access finance and channel it to countries and projects. If local governments are to benefit from the GCF they will require access to finance and support from national agencies that engage directly with local governments. While there is a recognised need for engaging agencies that are closer to local communities, the last three tranches of the GCF prioritised and fast tracked international entities from developed countries. The figure (see chart below) shows that out of 33 entities accredited by March 2016, almost 60 per cent are international organisations, including multilateral development banks and banks such as HSBC, Credit Agricole and Deustche Bank. Of the nine NIEs accredited, six are from emerging economies and none specifically cater to sub-national projects or sub-national executing entities. 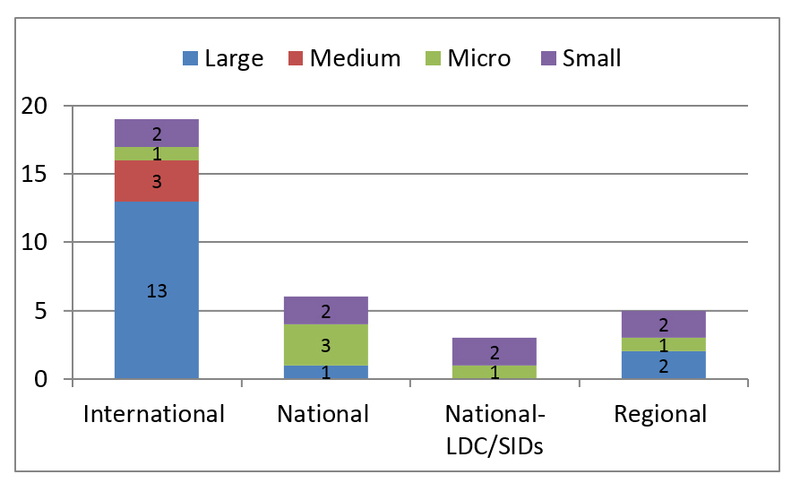 Only three national agencies in least developed countries (LDCs) and small island states have acquired eligibility to access finance directly: Centre de Suivi Ecologique (CSE) in Senegal, the Ministry of Finance and Economic Cooperation of the Federal Democratic Republic of Ethiopia (MOFEC); and the Ministry of Natural Resources in Rwanda. Although they have high fiduciary standards on paper, their track records remain weak as far as environmental and social standards are concerned. For example, HSBC has provided nearly US$5.4 billion in financing for coal since 2010. The IFC has on paper an excellent set of environmental and social performance standards, but implementation has not always matched the theory. Despite controversies, these agencies have managed to clear the accreditation process. Questions have been raised over dual standards, as the board seems to be less willing to accredit a national entity with a similar track record. In fact, during the 12th GCF board meeting in March 2016 in Songdo, the Ethiopian Ministry of Finance was relegated because it lacked a demonstrable track record. The limited amount of public finance available through the GCF should ideally be used to support innovative, community-driven projects in poor countries that will drive long-term change. Direct access is the best bet for this because spending is democratically accountable and the learning by doing which results stays in national and local institutions. The best chance of delivering adaptation finance in such a way that it reaches the local actors who do the bulk of the heavy lifting in terms of adapting to climate impacts – at least in countries with reasonably functional governance – is to channel funding through local government. Delivering funding effectively to the local level is not necessarily easy to achieve – but it can build capacity and sustained action if done well. In practice there is a limit to the number of entities that can be accredited. Because many sub-national agencies don't have the capacity to access finance directly, there is a clear need to prioritise national entities that already have experience of delivering finance to communities. Supporting smaller scale agencies, projects and technologies is key to solving access problems, but it requires a different financing infrastructure. The GCF could prioritise national funding agencies that have experience in channelling funds to smaller scale projects or executing agencies such as local or national governments. This could deliver support where large-scale infrastructure projects have failed for decades. The GCF's Readiness Support Programme should provide more assistance to prepare the NIEs. Now that nearly 60 per cent of the agencies are international, the most suitable strategy in the short term would be to put a cap on international organisations and focus on preparing national agencies. Similar to the GCF readiness sessions organised last week, the secretariat could focus on a batch of prospective NIEs particularly from LDCs. This will provide a good signal to these countries. IIED is taking preliminary steps to support national agencies that have experience of funding local agencies to get accredited by the Green Climate Fund. Bangladesh: IIED is providing short courses and trainings on GCF. Together with the National Designated Authority to the GCF in Bangladesh, we have prepared a practical handbook on the GCF that is designed to be an all-in-one resource for prospective NIEs. IIED facilitated a south-south experiential learning visit between Bangladesh and Senegal to share experiences of GCF accreditation. In collaboration with the Climate and Development Knowledge Network (CDKN), Acclimatise and the International Centre for Climate Change and Development (ICCCCAD), IIED is also engaged in a project to build the capacity of local private sector entities to access GCF directly. Mali: IIED is supporting the Agence Nationale d'Investissement des Collectivités Territoriales (ANICT) in its efforts to get accredited. The efforts are one preliminary step to help local communities access the GCF. With the legal mandate to channel funds at the local level and a part of Ministry of Decentralisation in Mali, ANICT fits appropriately to encourage local-level financing. Being a financial arm of the ministry, the agency also offers sufficient requirements (if not all) to secure accreditation. Tanzania: The President’s Office – Regional Administration and Local Government (PO-RALG), the agency involved in providing devolved climate finance at the local level, has requested support from IIED to seek accreditation as an NIE. These initial readiness support activities offer some hope for the possibility of broadening GCF accreditation to national agencies; particularly those that have experience of working with local governments. To prevent GCF resources from consolidating within well-established international institutions, it will make sense to scale up and speed up readiness activities for building capacities of national agencies that can work effectively at the local level. Without this change in orientation, the GCF will not achieve its objectives of spending half of its funding on effective support to adaptation – and then a further half of that in climate-vulnerable countries. It is time to take direct access seriously. Neha Rai (neha.rai@iied.org) is a senior researcher in IIED's Climate Change Group.